By Robert Weissman, Multinational Monitor. Posted March 9, 2009. $5 billion in lobbying to Congress got the finance industry lucrative legislative favors that paved the way for Wall Street’s devastating collapse. What can $5 billion buy in Washington? Over the 1998-2008 period, the financial sector spent more than $5 billion on U.S. federal campaign contributions and lobbying expenditures. This extraordinary investment paid off fabulously. Congress and executive agencies rolled back long-standing regulatory restraints, refused to impose new regulations on rapidly evolving and mushrooming areas of finance, and shunned calls to enforce rules still in place. “Sold Out: How Wall Street and Washington Betrayed America,” a report released by Essential Information and the Consumer Education Foundation (and which I co-authored), details a dozen crucial deregulatory moves over the last decade — each a direct response to heavy lobbying from Wall Street and the broader financial sector, as the report details. (The report is available at: www.wallstreetwatch.org/soldoutreport.htm.) Combined, these deregulatory moves helped pave the way for the current financial meltdown. The Financial Services Modernization Act of 1999 formally repealed the Glass-Steagall Act of 1933 and related rules, which prohibited banks from offering investment, commercial banking, and insurance services. In 1998, Citibank and Travelers Group merged on the expectation that Glass-Steagall would be repealed. Then they set out, successfully, to make it so. The subsequent result was the infusion of the investment bank speculative culture into the world of commercial banking. The 1999 repeal of Glass-Steagall helped create the conditions in which banks invested monies from checking and savings accounts into creative financial instruments such as mortgage-backed securities and credit default swaps, investment gambles that led many of the banks to ruin and rocked the financial markets in 2008. Holding assets off the balance sheet generally allows companies to avoid disclosing “toxic” or money-losing assets to investors in order to make the company appear more valuable than it is. Accounting rules — lobbied for by big banks — permitted the accounting fictions that continue to obscure banks’ actual condition. Financial derivatives are unregulated. By all accounts this has been a disaster, as Warren Buffett’s warning that they represent “weapons of mass financial destruction” has proven prescient — they have amplified the financial crisis far beyond the unavoidable troubles connected to the popping of the housing bubble. During the Clinton administration, the Commodity Futures Trading Commission (CFTC) sought to exert regulatory control over financial derivatives, but the agency was quashed by opposition from Robert Rubin and Fed Chair Alan Greenspan. The deregulation — or non-regulation — of financial derivatives was sealed in 2000, with the Commodities Futures Modernization Act. Its passage orchestrated by the industry-friendly Senator Phil Gramm, the Act prohibits the CFTC from regulating financial derivatives. In 1975, the Securities and Exchange Commission (SEC) promulgated a rule requiring investment banks to maintain a debt to-net capital ratio of less than 15 to 1. In simpler terms, this limited the amount of borrowed money the investment banks could use. In 2004, however, the SEC succumbed to a push from the big investment banks — led by Goldman Sachs, and its then-chair, Henry Paulson — and authorized investment banks to develop net capital requirements based on their own risk assessment models. With this new freedom, investment banks pushed ratios to as high as 40 to 1. This super-leverage not only made the investment banks more vulnerable when the housing bubble popped, it enabled the banks to create a more tangled mess of derivative investments — so that their individual failures, or the potential of failure, became systemic crises. Rules adopted by global bank regulators — known as Basel II, and heavily influenced by the banks themselves — would let commercial banks rely on their own internal risk-assessment models (exactly the same approach as the SEC took for investment banks). Luckily, technical challenges and intra-industry disputes about Basel II have delayed implementation — hopefully permanently — of the regulatory scheme. Even in a deregulated environment, the banking regulators retained authority to crack down on predatory lending abuses. Such enforcement activity would have protected homeowners, and lessened though not prevented the current financial crisis. But the regulators sat on their hands. The Federal Reserve took three formal actions against subprime lenders from 2002 to 2007. The Office of Comptroller of the Currency, which has authority over almost 1,800 banks, took three consumer-protection enforcement actions from 2004 to 2006. When the states sought to fill the vacuum created by federal non-enforcement of consumer protection laws against predatory lenders, the Feds — responding to commercial bank petitions — jumped to attention to stop them. The Office of the Comptroller of the Currency and the Office of Thrift Supervision each prohibited states from enforcing consumer protection rules against nationally chartered banks. Under the doctrine of “assignee liability,” anyone profiting from predatory lending practices should be held financially accountable, including Wall Street investors who bought bundles of mortgages (even if the investors had no role in abuses committed by mortgage originators). With some limited exceptions, however, assignee liability does not apply to mortgage loans, however. Representative Bob Ney — a great friend of financial interests, and who subsequently went to prison in connection with the Abramoff scandal — worked hard, and successfully, to ensure this effective immunity was maintained. At the peak of the housing boom, Fannie Mae and Freddie Mac were dominant purchasers in the subprime secondary market. The Government-Sponsored Enterprises were followers, not leaders, but they did end up taking on substantial subprime assets — at least $57 billion. The purchase of subprime assets was a break from prior practice, justified by theories of expanded access to homeownership for low-income families and rationalized by mathematical models allegedly able to identify and assess risk to newer levels of precision. In fact, the motivation was the for-profit nature of the institutions and their particular executive incentive schemes. Massive lobbying — including especially but not only of Democratic friends of the institutions — enabled them to divert from their traditional exclusive focus on prime loans. Fannie and Freddie are not responsible for the financial crisis. They are responsible for their own demise, and the resultant massive taxpayer liability. The effective abandonment of antitrust and related regulatory principles over the last two decades has enabled a remarkable concentration in the banking sector, even in advance of recent moves to combine firms as a means to preserve the functioning of the financial system. The megabanks achieved too-big-to-fail status. While this should have meant they be treated as public utilities requiring heightened regulation and risk control, other deregulatory maneuvers (including repeal of Glass-Steagall) enabled them to combine size, explicit and implicit federal guarantees, and reckless high-risk investments. With Wall Street packaging mortgage loans into pools of securitized assets and then slicing them into tranches, the resultant financial instruments were attractive to many buyers because they promised high returns. But pension funds and other investors could only enter the game if the securities were highly rated. The credit rating agencies enabled these investors to enter the game, by attaching high ratings to securities that actually were high risk — as subsequent events have revealed. The credit rating agencies have a bias to offering favorable ratings to new instruments because of their complex relationships with issuers, and their desire to maintain and obtain other business dealings with issuers. This institutional failure and conflict of interest might and should have been forestalled by the SEC, but the Credit Rating Agencies Reform Act of 2006 gave the SEC insufficient oversight authority. In fact, the SEC must give an approval rating to credit ratings agencies if they are adhering to their own standards — even if the SEC knows those standards to be flawed. From a financial regulatory standpoint, what should be done going forward? The first step is certainly to undo what Wall Street has wrought. More in future columns on an affirmative agenda to restrain the financial sector. 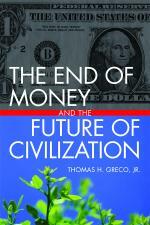 This entry was posted in Geo-politics, Global Economy, The Political Money System. Bookmark the permalink. How’s the housing crisis, and free fall in home values, likely to be solved if individuals can not get a job? There are an enormous number of men and women that have lost their houses to foreclosure and many more will until the USA starts making something more then debt. It is time to alter the free trade policies with the Chinese. For crying out loud, our primary trade partner is communist. I hope you would not mind if I posted a part of this on my univeristy blog? No problem so long as you provide attribution and the link to the source.